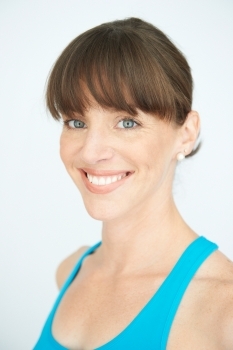 Kim McNeil is a freckled, Montreal-born gal who discovered yoga after her competitive swimming career came to an end. After retiring from the sport, Kim tried kickboxing, karate, and knitting but nothing seemed to fill the gap. As a last resort, she took her first yoga class in 1998.
multi-disciplinary approach to yoga therapy helps her clients manage their chronic pain, stress, and mobility issues. The result is a huge improvement in their quality of life which means getting back to doing the things they love to do. Do you have pain? Are you recovering from an injury? Have you found little relief from your yoga practice, or, even worse, that yoga has made your symptoms worse? Would you like to learn more about how to keep you and your students safe in yoga poses? Our bodies tell a story. Like a bad poker face, they give away our habits and preferences for how we like to move, or not move. If we look, listen, and feel for the tell, we can discover information about how to improve the quality of our movements and avoid injury. With a little patience, an open mind, and a new approach to your practice, you can use less effort in your poses to ultimately move better. In this workshop, you’ll learn how to easily incorporate yoga therapy into your practice so you can break old movement habits and compensations, reduce pain that has been nagging you for years, and improve your overall physical health. We’ll go over some of the most common teaching cues that are hurting instead of helping us, and how we can cue differently to keep our students safer. You’ll learn how going into and out of a pose is more important than what you look like in a pose. Finally, we’ll explore how doing less can offer us more in the long run in terms of improved strength, mobility, and flexibility. Call it easy yoga. Heck, call it lazy yoga. Too often, those with joint injuries or conditions that affect the joints, like arthritis, are left out of yoga classes or forced to sit out a pose because they aren’t able to practice. Yoga therapy is a perfect tool for those living with restricted joint mobility because it allows them to continue to stay active without putting excessive strain or stress on joints. When you understand how joints should and shouldn’t move, you can get creative with how to adapt a yoga class for those with unhappy joints. In this workshop, you’ll learn pose variations, prop use, and moves to avoid so that you can continue to practice even when faced with a temperamental joint. You’ll learn how to keep joints safe and stable during a yoga class by understanding the limitations of joint movement, learn contraindications of certain poses to avoid injury, and understand how to adjust a pose depending on the type of injury. We’ll also dive into the research on the benefits of yoga therapy for joint health, and discuss the role that movement plays in inflammation and healing. Learn the fundamentals of meditation as you are guided through a practice using various research-backed techniques, including compassion, gratitude, focused-attention, and mindfulness. We’ll discuss meditation myths and misconceptions. Leave with techniques to help you be less reactive, more empathetic, and more patient.